Despite traffic improvement being moderate compared to expectations, the city deemed the project a success, citing improved public safety statistics and positive feedback from tourists, residents, and local businesses. The New York Times reported that travel times improved by 7 percent on average, injuries to drivers and passengers fell by 63 percent, and foot traffic in Times Square grew by 11 percent. “It’s important to understand it’s more than just a minute or two of traffic improvement. 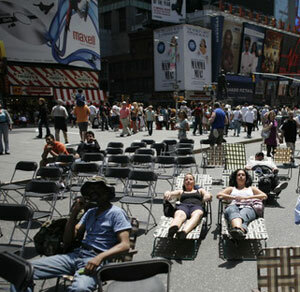 It’s about altering the entire Times Square experience” said Times Square Alliance President Tim Tompkins. In addition to the street closures, pedestrian plazas were created by adding outdoor furniture, painted pavement, and other landscaping to help attract foot traffic by enhancing the cultural experience. “It’s shifted the paradigm for what a street and sidewalk experience is supposed to be like in New York City,” said Tompkins. Now that the experimental project has been made permanent, the city plans to re-design the plazas to make them more aesthetically pleasing. In an announcement last week, Mayor Bloomberg said the city would soon put out bids for short and long-term improvements to the plazas. Janette Sadik-Khan, the city’s Transportation Commissioner said in a recent interview that short-term improvements will be completed this summer and involve furnishing the plazas with new paint, planters, and furniture. The long-term improvement plan will create more permanent structures including public amenities and entertainment infrastructure that can accommodate a variety of events and performances throughout the year. The city has not yet established a timeline for this phase of the project. The Architect’s Newspaper reported that design proposals would only be accepted from eight “large firms” in the city’s Design and Construction Excellence Program. While this move could limit the breadth and creativity of ideas, it stands to vastly speed up the design and construction process, as each of the targeted firms is prequalified for city work. This groundbreaking project represents a landmark opportunity in the fields of landscape architecture and urban design. It highlights the fact that cities around the globe are beginning to recognize the environmental, economic, and social benefits of creating public open space in dense urban areas. The new changes to Times Square also fall in line with the city’s recently released Active Design Guidelines, which were created to spur public health and combat rising trends in obesity through innovative design strategies. It encourages architects, landscape architects, and urban designers to create healthier buildings, streets, and outdoor spaces which promote active lifestyles and recreation. Learn more about the new Active Design Guidelines. Previous Article Land Matters: Should Arid Regions Be Landscaped? i follow this development closely and view the changes with trepidation and excitement. Interesting to note that no landscape architects are on the DDC’s design and construction excellence program list.